Sacred straw festoons (shimekazari) decorate doors during the New Year and serve as charms against evil spirits. The sacred Shinto rope is hung to indicate a purified place for receiving divinities. 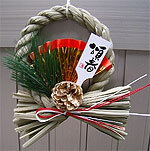 The shimekazari is made by attaching good luck charms such as bitter oranges, ferns and lobsters to the sacred Shinto rope. The good luck charms each have significance; the bitter oranges, for example, indicate prosperity of one’s descendants. When the New Year period ends, the decorations are brought to Shinto shrines and burned. In Buddhist memorial services, offerings are made unto the spirits of the dead and prayers said for the repose of their souls, but since ancient times memorial services also have been held for creatures other than human beings. For example, when a beloved animal has died or items used for a long time have broken or have become useless, memorial services are held for them because of the peculiar Japanese way of thinking that, filled with feelings of grief and thanks, one should do so. Nowadays, familiarity with this practice appears to have faded, but the Needle Memorial Services carried out on February 8 and December 8 are typical of such. To hold memorial services for broken or bent needles that have been used for a year, sewing stops on that day, while tofu (Japanese bean curd) or konnyaku (a paste made from devil’s tongue) is pierced with the bent needles, offered to a Shinto shrine and buried in the soil. Tatami mats have been used since the Heian Period (794 – 1185) when they were laid out only for sitting. From the time of the Muromachi Period (1333 – 1573), they were used to cover the whole floor. A tatami mat is made of straw bundled in layers and stitched together, and the surface is covered with tightly woven rushes. 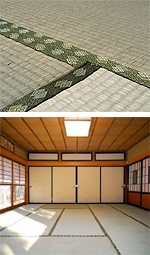 One tatami mat measures about 90cm x 180 cm, and the size of a Japanese room is expressed by its number of tatami mats. It is worthy of note that Japanese customarily avoid stepping on the edge of a tatami mat because that will hasten its wear and tear. The compulsory education time period in Japan is nine years, consisting of six years in elementary school and three years in secondary school. The school year begins in April. A three-term system is used, each term marked respectively by the summer, winter and spring vacations. Every class has its own fixed classroom where students take all their courses, except for the ones which require practical training and laboratory experiments. In public elementary and secondary schools, lunch is provided on a standardized menu and eaten in the classroom. All secondary schools require their students to wear school uniforms. The Ministry of Education closely scrutinizes curriculum and textbook standards, such that classes that teach approximately the same contents are taught at the same level throughout the country. Through uniformity and homogeneity, a high standard of education becomes possible. Dosojinn are deities that protect travellers, defending them against evil spirits and maintaining their safety on trips. Dosojinn are placed at roadsides and crossroads. 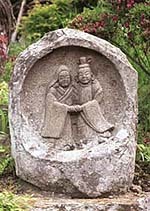 They are made out of stone, usually with the characters for “dosojin” carved into the stone and the figures of both male and female carved in relief. Originally, they were used to mark village boundaries and were apparently taken to be deities that protected villagers from the invasion of evil spirits. Now they are regarded as deities of marriage or as gentle deities with an affinity for children. Fireflies inhabit bushes found alongside clear streams and appear from around May in early summer till the middle of July. Since they emit a pale glow from their backs, appreciating the glow through an insect cage filled with fireflies has been a popular activity during summer nights. 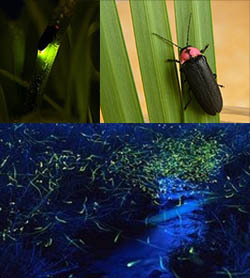 However, with the decrease of clear streams in recent years, fireflies have also decreased in numbers, making it hard to find them unlike in the past. 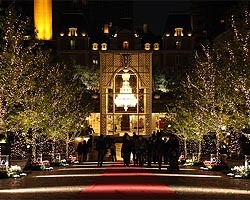 The glow of fireflies at one time was thought to be the altered form of the souls of soldiers who had died in the war. 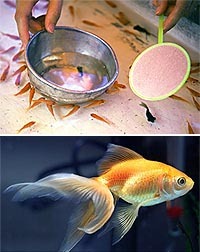 Japanese people like goldfish and usually keep them in a glass bowl. A pure breed of goldfish was imported from China at the beginning of the 16th century. Different types developed in the Edo period (1603 – 1867), and rearing goldfish for enjoyment became widespread. Until the 1960’s, goldfish sellers flourished in Tokyo, carrying around goldfish-filled buckets suspended from a pole on their shoulders. A game called “Kingyo sukui” (Scooping goldfish) is played at street stalls during summer festivals and fairs and even today it is still a poetic feature of summer. It is one of the three major festivals of north eastern Japan, including the Nebuta Festival in Aomori Prefecture and the Star Festival in Sendai in Miyagi Prefecture, and it is held from 4th to 7th August in Akita City in Akita Prefecture. 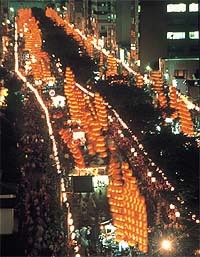 The Kanto Festival originated at a time when people believed that “during summer, we are overcome by sleepiness from the heat and intense labour and fall into a sleepy sickness”; so, to drive sleepiness away, people decorate Japanese cedar trees with lanterns in front of their house-gates. Today, in the hope of a bountiful harvest, the lanterns are modeled after the ear of the rice plant and the cedar trees have been replaced by Kanto bamboo poles 10 metres tall, each with nine horizontal poles attached to hang a maximum of 46 lanterns. As many as 180 of these Kanto bamboo poles stretch out in a row and light up the town at night. This festival, thought to have begun in 1703 with prayers for bumper crops, occurs in Kishiwada City, Osaka yearly on 14th and 15th September. 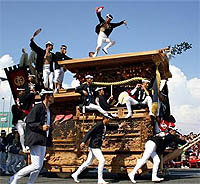 Danjiri are large wooden floats that weigh four tons, measure four meters high, and have a colourful exterior carved with famous scenes from tales of war. Five hundred to one thousand men forcefully pull the carts with ropes and bustle with great vigour around town. They are well- known for their brave yet dangerous acts which result in some injuries every year. Kimono are generally worn on occasions such as special ceremonies and parties, while Western clothes are almost always worn for daily activities. However, in recent years, the beauty and fashionableness of kimono are being re-evaluated. There are several kinds of ceremonial kimono. The prime ceremonial kimono for single ladies is the long-sleeved kimono (Hurisode), which has longer sleeves than a regular kimono. In addition, the prime ceremonial kimono for married ladies is the black fixed-sleeve kimono (Kurotomesode), with family crests. And there are ceremonial kimono that make no distinction between married and single ladies. Meanwhile, men wear the ceremonial clothes of the Japanese half-coat (Haori)and pleated loose-fitting trousers (Hakama) as their formal Japanese-style garments which make no distinction between being married and single. It is a typical wintertime dish in which various kinds of minced fish are processed and cooked in a pot, together with some other ingredients like Japanese radishes, kelp, eggs and konnyaku. 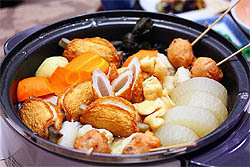 It is often prepared at home, but in cities, people are fond of eating oden at street stalls. 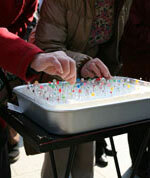 In winter, white-collar workers drinking warm sake, while eating oden at street stalls are conspicuous. In recent years, oden is available even at convenience stores. Most people in Japan, not only Christians, enjoy Christmas by exchanging presents with family and sweethearts and having meals together. The strategy of department stores and businesses, which is to stimulate consumers’ desire, has created this sort of Christmas culture. By the end of November, decorated large trees beautify shopping districts and advertisements for Christmas sales are in full swing.